This policy provides the opportunity for residents to dedicate a tree or park bench within the Butler Township Park System to memorialize an individual, or to commemorate a special occasion including the memory of someone who has passed, in honor of a dedicated service member, to celebrate a birthday, a graduation, retirement or any other occasion. 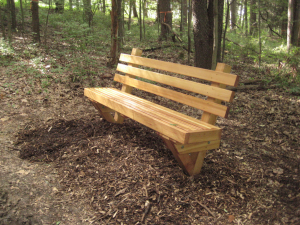 Additionally, the dedication of trees and benches helps enhance and beautify Butler Township’s parks while helping to meet our vision of developing a premiere park, recreation and open space system. The Township and the community have an interest in ensuring the best appearance and aesthetic quality of their public facilities. Park elements and their associated donation acknowledgements should reflect the character of the park. All park elements will be installed in such a manner that will not substantially change the character of the park or its intended use. An application in writing is required and is limited to residents of Butler Township only (either donor or honoree). An application can be obtained at the township office or at the township website. The Township has the responsibility to review donation applications and the authority to deny those that it determines would be inappropriate and/or that would predictably attract vandalism. Donors may request a location in any township park in which benches and trees have been identified as needed, however placement of park amenities in the park system must meet the master plan and requirements of the particular park. Some locations may become unavailable for donated elements. Complete funding for the donation must be processed before commencement of any work and reservation of a location. The current donation pricing is listed on the application forms. These amounts will be subject to semi-annual review and adjustment as needed. The Township will determine the level of maintenance required for the donated property and the type of care needed to reasonably maintain the donation or until such time the township determines that it must be removed and/or relocated. The Township has an interest in ensuring that on-going maintenance costs do not negatively impact the resources available for maintenance of other Township park facilities. The costs to cover the planting/delivery, maintenance and care will be in addition to the base cost of the donated item and factored into the pricing of the donation. Accordingly, the Township has the duty to maintain the donation only for the expected life cycle of the donation. Due to the timing of park planning processes, annual review of park amenity requests, and planting schedules, the total donation process may take six months to one year or more. All donated park elements become Township property. Donations made previous to the adoption of this policy are to be maintained by the Township during the useful life spans. Butler Township reserves the right to relocate or remove the tree or bench if unforeseen circumstances arise due to its location or setting or to accommodate future park development or changes in site or element conditions at any time. The Township will make the final determination on new location or useful life. Recognition plaques may be placed on benches, but not on “green” donations (trees or plantings). The Township will not be held responsible for damaged plaques resulting from vandalism or any other condition or act that would require replacement. The township will attempt to maintain plaques in good appearance. Some plaques may become damaged or deteriorated beyond repair and require removal. Plaque replacement or repair will be at the expense of the donor. A ceremony or gathering at the time of dedication is permitted but must be arranged in advance with the township and must be done in accordance with township ordinances. To ensure public use and safety, memorial wreaths, flowers or any other items placed for a private gathering or ceremony must be removed immediately following the dedication by the donor. In order to maintain the integrity of our parks, decorating the trees, benches or the area around them is prohibited as these materials can become hazardous to the people or wildlife utilizing our parks. A 10” x 5” bench plaque may have 4 lines with a 50 total character maximum. An 8” x 2” plaque may contain three lines with a 18 character per line maximum. The plaque will be securely inset on the bench in the most suitable location. 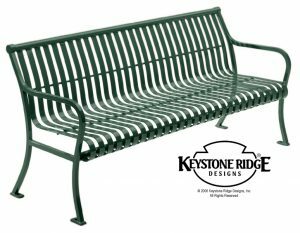 Once the application with payment for the donation has been received and approved, the Township will purchase and install the bench, which will be of a style appropriate to its site, as determined by staff and in accordance with the park master plan. All benches will meet the standards of the Township design, durability, and construction. The Township will determine annually the availability of bench donations. Park benches in outdoor settings have a reasonable life span of about 10 years. The Township will provide for normal maintenance and repair of the bench during its useful life. The cost of this maintenance is included in the price of the donation and this cost will be reviewed periodically. If bench removal is required, due to deterioration or severe vandalism, the Township is not responsible for replacement of the bench. Memorial plaques from removed elements may be kept by the Township but is not guaranteed. Donors may request return of a plaque if available. Donors may choose any Township park with planting availability. Planting availability will be determined annually. Tree species can be selected from an approved list and tree caliper must be a minimum of 2” for deciduous trees and tree height of 5-6’ for evergreen/coniferous trees. Tree donations will be limited to the list of selected plant material, amenities, and locations consistent with Township landscape plans and standards. Dedication requests may be made at any time of year but planting time (in the spring and/or fall) will be determined by the Township based upon the best time to plant the particular species chosen as determined by the nursery. The township will take reasonable care to preserve newly planted trees and make all diligent efforts for the tree’s growth, but donors must realize that there may be conditions beyond Butler Township’s control that threaten plantings and the township cannot be held responsible should the tree die or become diseased causing it’s removal. Trees have limited life spans and are subject to natural disasters, vandalism, disease, and abuse and expectations are that it may at some point need to be removed. Each tree donation will be recognized by the issuance of a Certificate of Acknowledgment and a map of the tree location presented to both the applicant and the honoree or the honoree’s family when the tree is planted. Donors can also remember or honor a loved one by assisting the Township with future improvements and maintenance of the parks. These general donations in any denomination will be used on an as needed basis, to replace and plant trees/shrubs, improve trails, replace signage, replace trash receptacles and other needs that will beautify the Butler Township Park system. General donations to the park development program will be recognized with a Letter of Acknowledgement and Appreciation. This policy does not supersede any regulations or ordinances of Butler Township. Administration Offices will be closed. Registration is required. Please call the Administration Office at 724-283-3430, X 212 to register.